While Jira is extremely powerful in tracking the status of development work, it is not the ideal tool when you're planning work for multiple teams, across multiple projects. Jira easily becomes too granular, which can make more challenging to see how multiple projects and initiatives are tracking towards the bigger picture. Jira helps fill in this gap by simply pulling in relevant issue details, and then uses these details to create a realistic schedule for all the work you're planning. Once your Portfolio plan is set up, you and your teams can then have a single source of truth into the current and future health of your initiatives. With your plan, you can also create reliable forecasts of the work of your teams in Jira — and all that while keeping track of current work in an ever-changing agile environment. The purpose of the sample plan above is to track the long-running initiative of mobile expansion. There are 3 teams working together, to complete this initiative as a whole — the iOS team, Android team, and Design team. The Mobile expansion product manager is using Portfolio for Jira to plan and schedule work for these 3 teams, using relevant issue details that come from their individual boards in Jira. What is Portfolio for Jira? 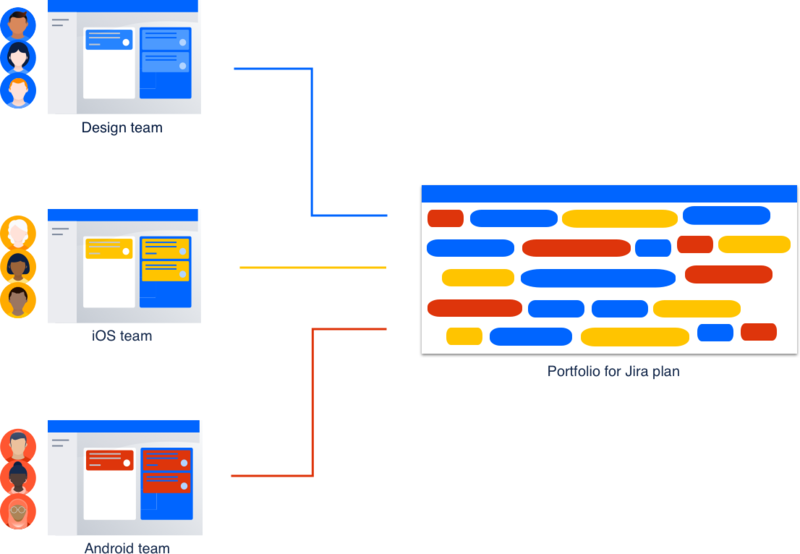 Portfolio for Jira enables realistic strategic planning, regardless of how many teams or people you have working towards your goals. Together with Jira, Portfolio for Jira provides a single source of truth for the current and future health of your initiatives. Create a plan or program from the existing data in Jira, and roll up your epics into initiatives to get a cross-team and cross-project view of your work. Advanced users can auto-schedule issues to create a realistic schedule. Portfolio considers multiple variables, including backlog priority, estimates, dependencies, and more — to generate a plan in a matter of seconds. Manage teams and their velocity to avoid bottlenecks and over-utiliizing their capacity. Team and capacity management help you ensure the right people are available when needed. Make fast prioritization and trade-off decisions, and instantly see the impact of such in your plan, so you can answer 'what-if' questions. Set business goals and track progress to make sure the team is indeed executing on strategy, with everyone aligned to the same priorities.